This blog post is written by me on behalf of Aidells® Sausage and The Wine Group. The opinions and text are all mine. 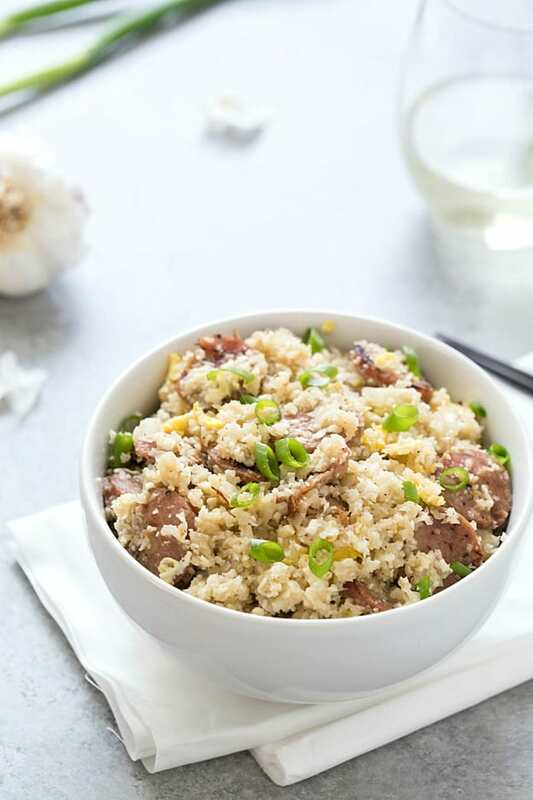 Sausage Cauliflower Fried Rice – A delicious and healthy alternative to the popular dish. 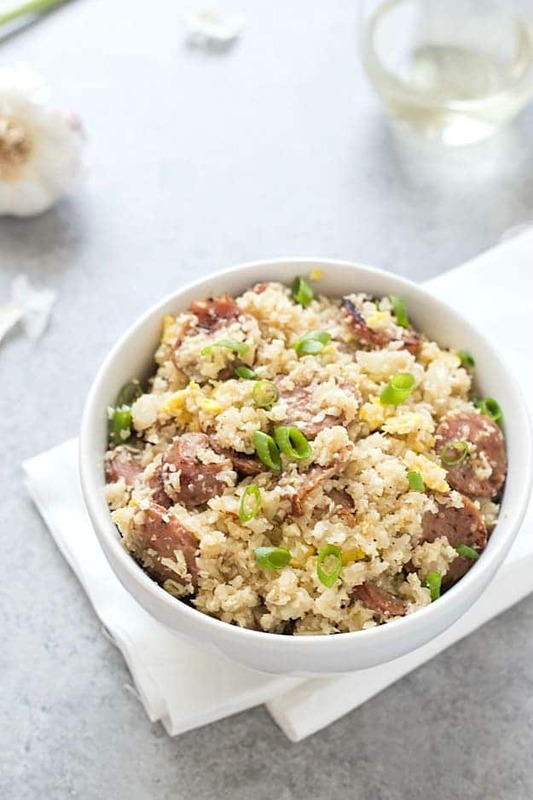 Loaded with chicken sausage, cauliflower rice, eggs, and seasonings! Made in 20 minutes or less! Low-carb and keto taste buds approved. If you haven’t noticed already, you can tell my family loves easy comfort food recipes. One of our favorites we used to order out a lot of time was fried rice. It tastes great, but it’s not healthy for you at all. In one sitting I could eat an entire container by myself. Not kidding at all. Even if you make fried rice at home it’s still not the best for you because it’s loaded with carbs and I am back to my low carb way of eating right now, but my husband isn’t. So I decided to lighten-up one of our favorite dishes and make it a little unique. As you can already tell, I substituted the rice for cauliflower rice, the soy sauce for liquid aminos, omitted the carrots and peas, and added delicious chicken sausage to the mix. Still so easy and it can be made in 20 minutes or less. If you have never made cauliflower rice, you won’t believe how easy it is! You start with a fresh cauliflower head. It’s nearly impossible to make cauliflower rice with frozen cauliflower, would be so mushy. You then will need to cut the head into small florets and pulse them a food processor until they resemble grains of rice. That’s it! With this dish also being light, it’s perfect for a summer lunch or dinner option. It’s perfect for when you have company over too because it’s so quick. Sounds like the perfect meal to open a bottle of wine to share with friends and family on the porch. Looks like a fantastic time to me. 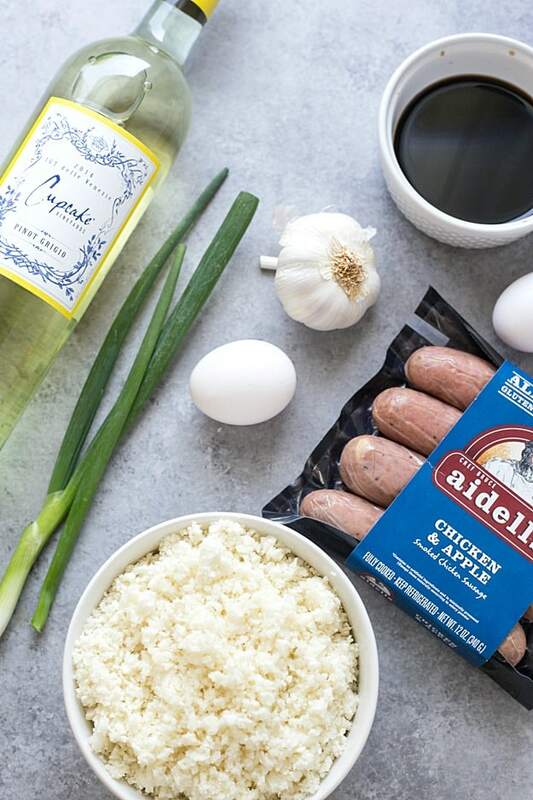 The type of sausage we decided to use was Aidells® Chicken and Apple Sausage because it’s naturally gluten-free, doesn’t contain any added hormones, made with real fruits and vegetables, and fully cooked already. They taste amazing. We can’t wait to try them on the grill soon! The wine I paired my sausage cauliflower fried rice with is The Wine Group’s Cupcake® Pinot Grigio. Pinot Grigio is one of my favorites, and it pairs beautifully with this dish. It’s one of my favorites because it’s luscious, creamy, silky, zesty, intense, elegant, and delicious. I am so glad I happened to run into the Aidells® Sausage while I was in Safeway. It’s a must-have for our family now. 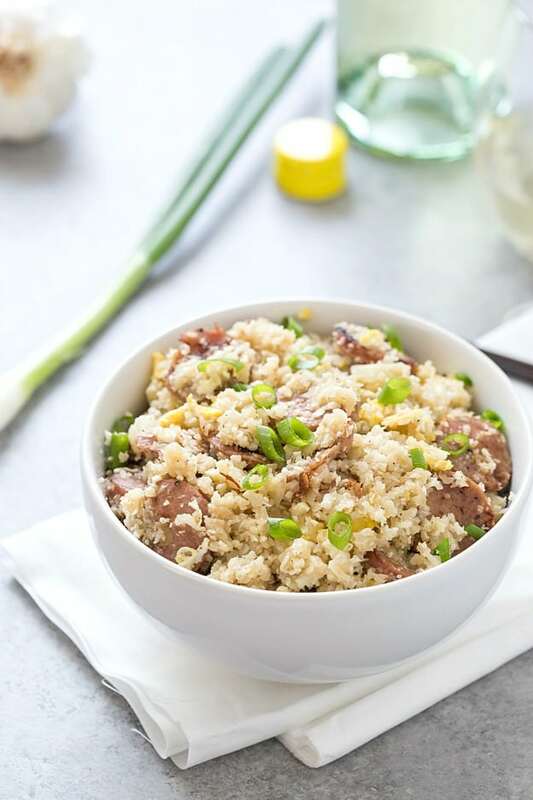 Sausage Cauliflower Fried Rice - A delicious and healthy alternative to the popular dish. Loaded with chicken sausage, cauliflower rice, eggs, and seasonings! Made in 20 minutes or less! Low-carb and keto taste buds approved. Place the olive oil in a large pan or skillet and turn the heat onto medium. Pulse your cauliflower florets in a food processor until it resembles grains of rice. May have to do in batches if you have a smaller food processor. Place your cauliflower rice into the hot pan and saute over medium heat. Add the diced chicken sausage links and stir to combine. Cook over medium heat for 10 minutes or until the chicken sausage is heated through and the rice has a nice color to it. Mix in the minced garlic, season with salt and pepper. Add the liquid aminos or soy sauce and mix until combined. Move the cauliflower rice to one side of the pan, crack open the eggs and place onto the other side. Using a spatula, scramble the eggs. Once cooked mix the scrambled eggs into the cauliflower rice mixture. Place the green onions, sesame oil, and crushed red pepper chili flakes into the pan and mix until combined.